It’s the birth date of Clyde Robert Bulla (1914–2007), A Lion to Guard Us. Before Barnum & Bailey or Ringling Brothers, Philip Astley stages the first modern circus in London, 1768. Read Henrietta Hornbuckle’s Circus of Life by Michael de Guzman. Happy birthday Connecticut, the fifth state to be admitted to the United States in 1788. Read A Connecticut Yankee in King Arthur’s Court by Mark Twain. The United Nations headquarters officially opens in New York City in 1951. It’s Positively Penguins Day. If you didn’t get to it before, read Mr. Popper’s Penguins by Richard and Francis Atwater or My Season with Penguins by Sophie Webb. On January 9, 1886, Walter R. Brooks was born in Rome, New York. Orphaned at an early age, he was sent to a military academy and then attended the University of Rochester. An interest in homeopathic medicine brought him to New York City, where he worked for the Red Cross. He then turned his hand to writing, at first stories for The New Yorker and Scribners. Many of his short stories for adults, which appeared in Saturday Review and Esquire, featured Ed the Talking Horse—the inspiration for a 1960s television series. But Brooks’s novels for young people centered on a very unlikely protagonist—who overeats, sleeps too much, daydreams, and is very lazy. Not the usual characteristics of a heroic figure. 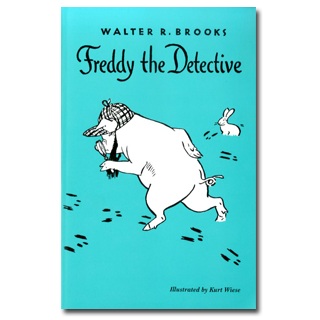 But Freddy is a pig, and he starred in twenty-six books that began in 1927 with Freddy Goes to Florida. Freddy, however, does possess virtues; he is even something of a Renaissance pig. He writes poetry, paints, edits the Bean Home News, and most important, runs a successful detective agency that has been based on the solid principles established by Sherlock Holmes. Freddy is also a balloonist, a magician, a campaign manager, and a pilot. 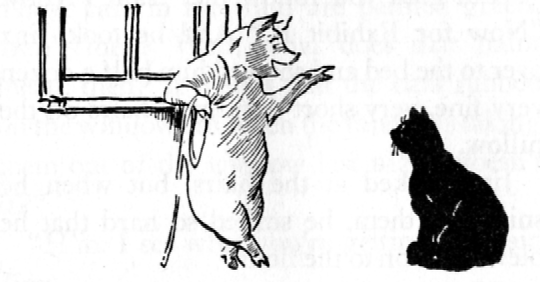 He and the other barnyard characters—Mrs. Wiggins the cow, Jinx the cat, Hank the horse, and Charles the bragging rooster—have a lot of interesting adventures together. All of these books prove that animal fantasy, with just the right amount of humor, can entertain adults and children in equal measure. Happy 115th birthday Walter R. Brooks; over the years, you have made it possible for so many families to enjoy your gentle, but funny, universe. But Freddy did not answer. He was being a detective for all he was worth. He went very carefully over the floor, and then he examined the bed and the window-sill, and finally he got a tape measure out of Ella’s little sewing-basket and measured the height of the sill and the distance from the bed to the window and several other things. Jinx sat down by the door and watched, trying hard to look superior and sarcastic. But it’s hard to look superior and sarcastic all by yourself when nobody’s paying any attention to you, so after a while he give it up and went to sleep. Originally posted January 9, 2011. Updated for . Ooh, I’ve always wanted to read these, and I even bought this last year but it disappeared into my TBR stack. I think I’ll move it back on top. Thanks for the reminder. I’m definitely going to delve into these. Thank you. This is another read-aloud I remember really well. My teacher had this southern drawl (he was from Texas) and when he read these characters, they just came to life! If you would like free ebooks of Freddy, try Faded Page in Canada. They’re considered public domain in Canada, and while the collection isn’t complete, you can get about half of them.